Our first story begins with Govinda (Raj Kapoor) returning to his village after being away at school for twelve years. He was sent off to the city for his education by his father (Badri Prasad) when his childhood friendship with a local untouchable girl created consternation and gossip in the village. 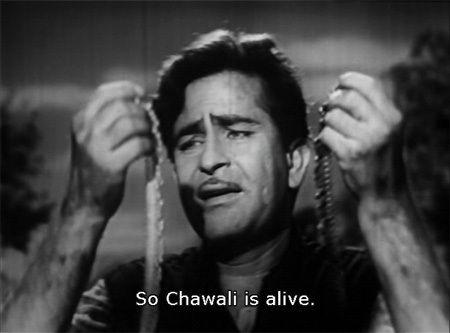 But his feelings in the interim haven’t changed, and nor have Chawali’s (Meena Kumari) for him. 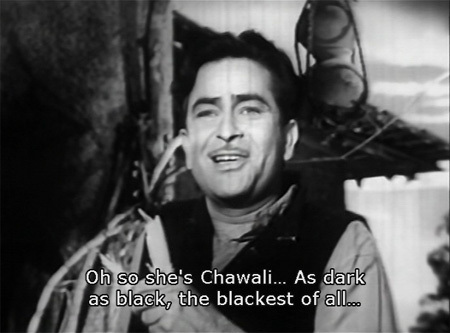 Govinda teases Chawali about her skin color and caste (Meena is painted black, basically), but it doesn’t matter a bit to him. Nor does he care about an early marriage that she was forced into, resulting in an almost equally early widowhood. 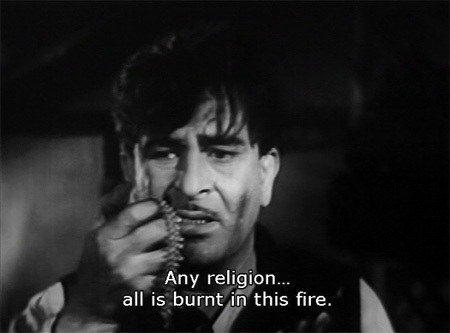 This might be my favorite Raj Kapoor role ever. He portrays Govinda with a great deal of charm, but with a firm conviction in his principles and his love, even in the face of total opposition from the community. Govinda is an outward-looking character; it’s not all about him, but about what’s right, and about the woman he cares for, and that’s a nice relief from his many more self-indulgent characters. Meena herself excels as the downtrodden Chawali by not playing her as a victim, but endowing her instead with a resilience and courage that makes you root for her. Govinda persuades her to accompany him to the temple to get married. As children, Chawali was thrown out of the temple by the pujari (Nana Palsikar), but she tells Govinda that for the past couple of years she has been allowed to worship there. Alas! Although things may have changed on the surface, the wily priest has not changed his fundamental beliefs. He puts them off by saying that Govinda should marry Chawali openly, knowing that the villagers will not tolerate it. And of course, they don’t. Govinda manages to find one person—Chandu Pahalwan (Vishwa Mehra), who was orphaned as a child and has never identified himself with any caste—to walk with him in a baraat of two, Chandu playing his drum. But as they make their way to Chawali’s house, where Chawali has dressed as a bride and waits, the people of both her and Govinda’s communities rise up in anger. Govinda arrives to find her home in flames and nothing but one of her anklets inside. He leaves the village, devastated, disowning his family and community. Stumbling along in grief, he winds up at a crossroad where he steps on an anklet exactly like the one he had found in Chawali’s home. He decides to stay at the crossing until he finds someone with an idea of which way she might have gone. To that end, he begins asking everyone coming through if they have seen her, including a chauffeur named Dilawar Khan (Ajit) who has stopped to put water in his car engine. Dilawar has not seen her, and a shout from his boss prompts him to get back behind the wheel. His boss is the Nawab of Sultanabad (Anwar Hussain). 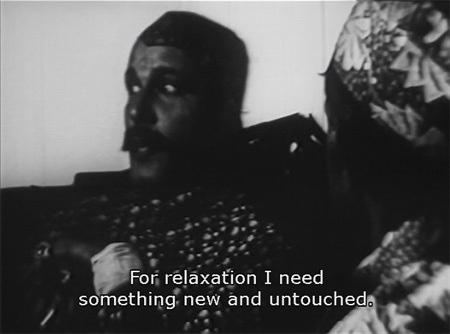 The Nawab is distraught; he is being dispossessed of his kingdom by the Indian government, and he has not slept in days. 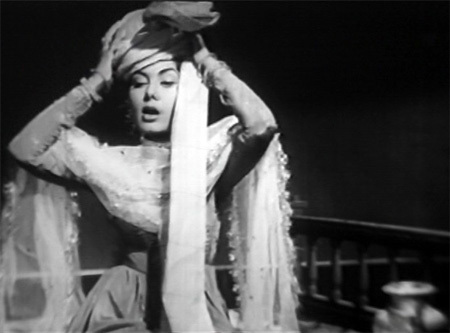 His advisor, Izzat Beg (Rashid Khan), tells him about a new girl in town who reportedly sings and dances like a dream, and he suggests that she be brought to entertain him. Izzat Beg assures the Nawab that Pyaari is untouched, and Dilawar Khan—listening from the front—snorts in disbelief. 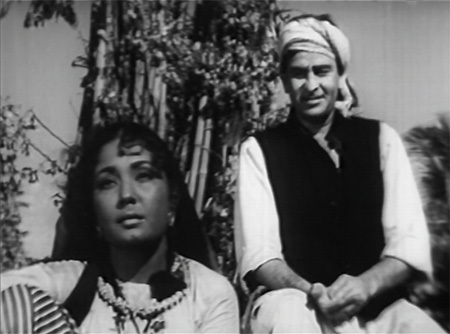 When he is sent to fetch Pyaari (Nimmi) and drive her to the Nawab’s palace, he is disdainful and rude to her. When she asks him why, he says that he’s loyal to his master and hates to see him wasting his money on prostitutes. She spiritedly asks him then whose mistake it is—hers or his master’s? She meets the Nawab, who asks her for a song that will lull him to sleep. She stays up the whole night singing, as he sleeps peacefully. Anil Biswas’ music is pretty, by the way, and the lyrics quite wonderful as one expects from Sahir Ludhianvi (and subtitled, yay!). When he wakes in the morning finally refreshed, he is very pleased with her. She replies that the fact that he was able to sleep is reward enough for her, and he is even happier with her sweet reply. He says he will think about a fitting reward for her, and asks her to come and sing for him every night, to which she agrees. 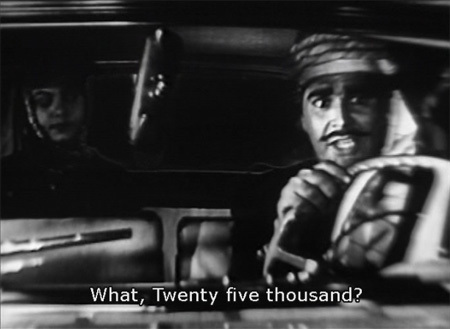 As Dilawar Khan drives her home, he asks her how much money his master gave her and is outraged at her chirpy reply. I love this pair! They are hilarious, these two proud people sparring with each other. At home, she asks her mother (Shankuntala) if she was right in refusing a reward from the Nawab. Her mother—a former tawaif herself—assures her that she was; it was an investment in a longer-term relationship! That night when the Nawab tells Dilawar to fetch Pyaari, Dilawar refuses to go. 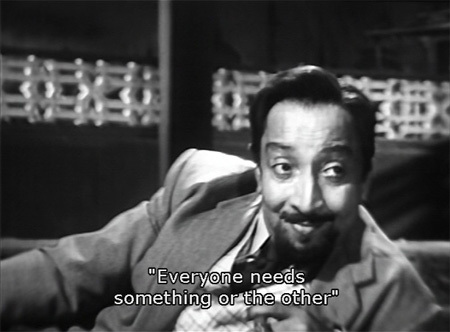 The Nawab is momentarily confused and then highly amused when Dilawar explains further. His misconceptions cleared, the Dilawar Khan who picks Pyaari up that evening is a changed man, laughing and joking with her. He watches her performance that evening for the Nawab and his guests from behind a screen, and is smitten. He’s not the only one, though; when her dance is finished, the Nawab takes several strands of pearls from around his neck and tosses them to her. When she throws them back, he nods approvingly. 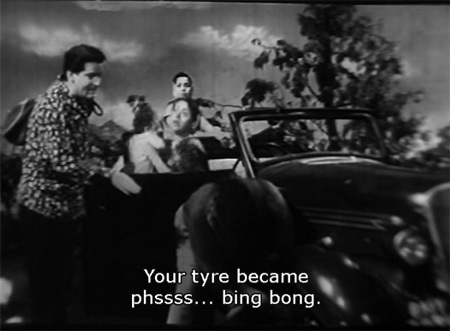 As Dilawar drives a tired Pyaari home, he thinks she’s asleep in the back seat and confesses aloud that he loves her. She’s not asleep, of course, and I sigh happily as she smiles to herself. 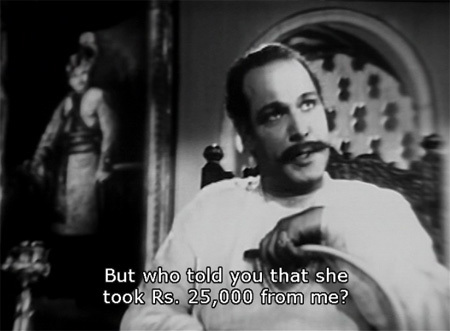 A few days later, the Nawab is officially stripped of his title and kingdom, and he asks Pyaari if she will accompany him to Bombay as his mistress; he will set her and her mother up and give them each 1000 Rs for life, he says. He sends her home, then, asking her to think about it. Dilawar Khan has heard about his Nawab’s intentions. He takes Pyaari to his humble home, where she tries on one of his turbans (so cute!). He asks if she is planning to go with the Nawab to Bombay. She shyly tells him that she would rather stay with him, Dilawar, and he’s jubilant. Pyaari herself is astonished when she discovers that he has honorable marriage on his mind. I melt—but not for long. 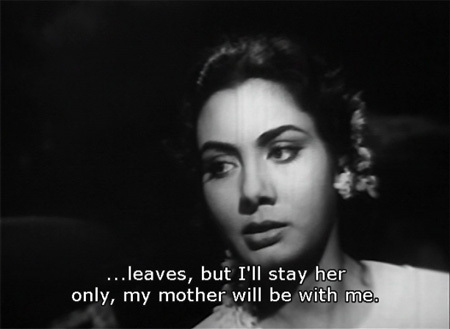 Dilawar has no intention of allowing Pyaari’s mother—a prostitute—to live with them. Pyaari is only guilty of singing and dancing, but her mother is another story, in his mind. Seeing that she is upset, he tries to reason with her, saying that the girl’s mother never lives with a married couple. She points out that other girls’ mothers have homes, husbands, sons, but that a prostitute has only her daughter. She says that until he apologizes and accepts her mother as part of their family, she won’t go with him. He says that day will never come, and drives off in a fury, leaving her by the roadside. Aargh! But good for Pyaari! I am solidly on her side and I shake my fist in Dilawar’s general direction. He roars past another motorcar pulling up in the crossroad with a flat tire. I perk up considerably as Shammi strolls by whistling and stops. 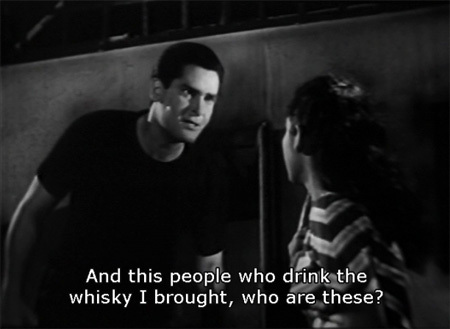 I feel seriously that this may be his best—most descriptively essence-of-Shammi—entrance line ever. 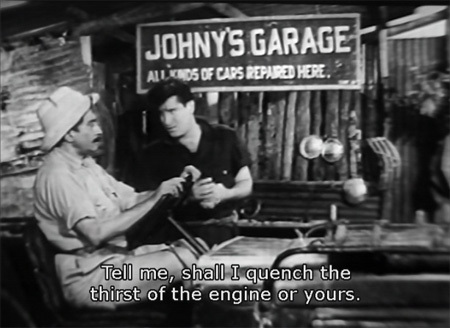 His name is Johny Braganza, and he offers to change the tire for them. The car belongs to a family of three traveling with their nanny, Stella (Kumkum). Stella hands him a tire-iron, and he perks up. So does she. So do I! He’s looking for work, and they all end up at the Hotel Parbat where the family Stella works for is staying. I love the hotel sign. 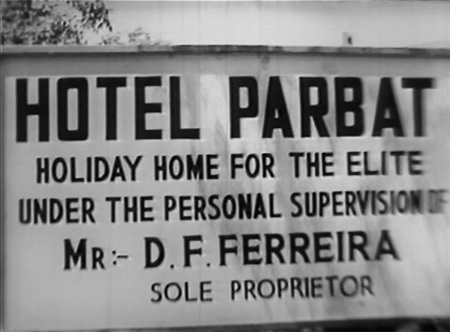 We have seen the sole proprietor Mr. Ferreira (David) before at Pyaari’s place. Ferreira is attracted to Stella himself, and he gets rid of Johny by setting him up to be arrested by the police for selling liquor. 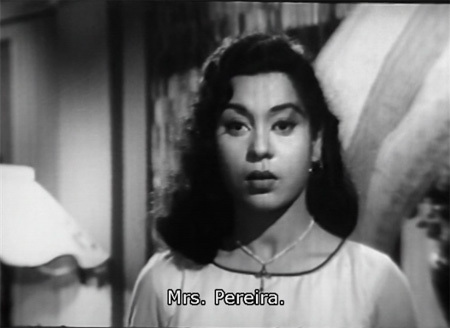 After three months in jail, Johny (still unaware of Ferreira’s role in his imprisonment) is released and goes to Ferreira for his back pay, and to find out where Stella has gone. Ferreira tells him that he’s paid for Stella’s father’s treatment, and that Stella is now his wife. Deeply hurt—and furious—Johny leaves. He uses the money from Pereira to start up his own auto body shop, and continues his illegal bootlegging activities. Now the threads of our plot begin to get woven together as a labor leader appears in the form of Nirmal (P Jairaj). So what has happened to Govinda? Is he still searching for Chawali? Is Chawali still alive? Will Dilabar Khan ever come down off his high Pathan horse and reconcile with Pyaari? How are she and her mother eking out a living? Is the Nawab still lurking? What about Stella? Is she happy with Ferreira-Pereira? (Noooo!) Can she and Johny ever find their way to each other? And the most burning question of all: will India find a path to prosperity and equality for all?! (Well, okay, the film doesn’t actually cover that.) Watch Char Dil Char Rahen for almost all the answers. The acting is good, songs are lovely, and the plot (if you haven’t had the patience to read through this long post) compelling, all up until the all-too-flat and glib ending. If that had sizzled instead of fizzled, what a film this could have been! Posted on October 11, 2009 at 5:24 pm in Hindi movies, Yahoo! Shammi! | RSS feed You can skip to the end and leave a reply. I liked Shammi in this. Discovered a song I had heard and didn’t know which movie. Dear Johnny Darling Stella. And I have not been able to find it on youtube in its original form. He does look slim, doesn’t he? My list of movies to watch on dvd is growing! And he and Kumkum look good together. I like her. Only seen her in a few roles mainly Kohinoor, Ujala, Dharti. Yes, Kumkum is beautiful :) And Shammi even more so! He’s wonderful in this, all the acting in it in fact is good. I have gone through the entire post- spell bound and seeking more. Does this movie actually have such an elaborate plot like this. One must say that the story line is quite progressive by the standards then prevailing in India. And reading your account, all the main characters actullay sound like real life characters, not caricatures. Your post has certainly aroused my curiosity. It’s a very elaborate plot, and very involving :) Glad you did not get bored as my post went on and on (I edited it down, but couldn’t get it much shorter than it is now! )…It’s worth watching, although as I said the ending (at least as it is on DVD) is a let-down. Not because of how it ends, but because it’s just very hurried—and after all that investment, you really want to savor it! Raj was likable! Honestly! Not at all self-indulgent. I liked him quite a bit. Raj and Shammi only actually shared screen space in a song as I recall, but it is fun to have them both in it. Wow…like Atul above, I am all curious now. That was one pretty good storyline and looks like all the characters were well developed and human. Please do let us know what happens in the end and why you were disappointed with it. The ending just wrapped everything up too quickly and easily—after investing emotionally in all these stories, which I did, because they were well-written and performed beautifully, I wanted a chance to revel in the resolution of each one and didn’t get it. It was too choppy and I felt cheated of the emotional payoff that I really wanted. Wow, what a movie. How come nobody has heard of it bfore? I love it when all the heroes are as we would like them! Even Raj Kapoor seems so likeable here! I hope this has a happy ending! By the way, why Char dil aur char rahen (four hearts and four paths), shouldn’t it be cheh dil (six hearts and ??? paths)? Is it ‘explained’ in the end? Or are there four stories? Totally confused! It is the firt time I see David without his bald pate! I will email you the ending if you like :) Don’t want to ruin it for others, because it is worth watching. Ooh, could you email it to me? I wanna know! It sounds amazing! I have not seen the film (although after reading your review, I am quite keen to watch), but I am sure that the rough ending should be the result of rotten film stock. The film is by K A Abbas who is a very skilled storyteller and a shoddy ending is ruled out in his film. (Many of RK’s film’s, from Awara to Bobby and Henna, are written by Abbas). And by the way, Amitabh Bachchan started his career with K A Abbas’ film- ‘Saat Hindustani’. I am a fan of KA Abbas’ storytelling too. I think a lot of the choppiness was due to deteriorated film (or an idiot editing for Eagle DVD). There were parts where the focus was very blurred and the picture quality not the best, which is probably a restoration issue more than anything. Whatever the reason, it was very disappointing. But still worth watching! Now I want to see the movie and find out how it ends. And how all the loose ends get tied together. BTW, jsut wanted to tell you: Your reviews are NEVER long. I love them just as they are! You get bored, cause you know what you’ve written, thus becoming blind to it. keep the length of your reviews the same! Those people who drink the whiskey are the same men who in public support prohibition and good moral values, but behind the scenes drink and debauch. Sounds oh so familiar, doesn’t it? The slouchy voice just sounded like the usual Lata (or maybe it was Meena Kapoor, I confess that they all kind of sound the same to me). This one seems like a real good story. Strange that this movie is obscure (I am guessing it is !!!). I have myself only ever vaguely heard about it and had no clue who featured in it. So here is another movie that I should now try to watch after reading your review. I can speak to the physicality of film in discussion of the ending. The beginning and ends of reels are subject to both deterioration and the wear and tear of cutting and splicing, as they get threaded through the projector. If something gets ripped, or burned, just cut it off! Also, it’s not unknown for a projectionist to remove his favorite scenes for his personal collection. 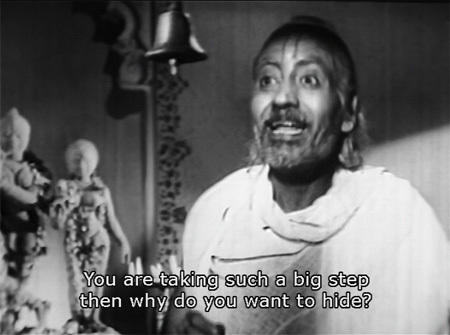 So many Hindi film DVDs are of completely unrestored films–well, maybe most of them! The DVD immortalizes the condition of one of the few remaining prints of the film after its last theatrical showing. The story flows so smoothly through the first two thirds or three quarters of the film that I do think a lot of the issues at the end had to do with damage. Although the painstaking set up may have taken so long that the producer or someone finally said—Can we get this over with? and wrapped it up too quickly. LOL! I probably would have done the same in your place, although I have to admit that my favorite storyline (in case you couldn’t tell by the fact that I dwelled on it the most) was Ajit and Nimm’s. They were just SO CUTE together. I don’t think this review was long. In fact I was sad when it ended. Nooooo! Watching Mard is three hours of sheer cracktastic roller-coaster fun! :) But thank you, I’m really glad you like them. I think you liked this movie much more than I did. For me beyond the fabulous music (I have a friend who wants the exquisite “intezaar aur abhi” played on his death bed) and the mildly interesting episodic plot structure, there wasn’t much to engage me in Char Dil Char Rahen. And underneath the somewhat unconventional narrative framework, the stories of themselves were pretty well-worn…almost clichéd. I guess I did like it a lot more. I found the characters very engaging, especially Ajit and Nimmi. And Shammi was v.v.charming and handsome, and hilarious. Such a bad boy. Ah well, to each his own! Oh this sounds lovely! I’ll take a squealing Raj any day, thankyouverymuch. 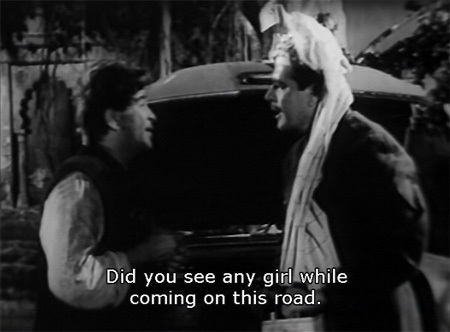 LOL And Shammi charm is often enough to carry me through by itself, even without Raj. What a wonderful write-up of a movie I must now get, simply to see Ajit and Kum Kum! IS THAT A LINK TO A NEW BLOG I SEE, PEDRO? This news deserves as many huzzahs as I usually reserve for a new old Shammi fillum! It’s 1959, David must have been wearing a wig. Indeed! :-) But there are two actors who never seems to have been young: David and Om Prakash. That is SO TRUE. Poor guys. I saw Om Prakash recently where he was probably pretty young, but did not look it :) But he did manage to STOP aging—he seemed to stay at about 55 for two decades or so! one more question char dil char rahen= four hearts four ??? I think the best translation for Char Rahen is four ways? as in directions/roads? but maybe a proper Hindi speaker can do better. It’s only just come out on DVD, hasn’t been available before to my knowledge. Hooray for more new old Shammi! Char Rahen means 4 Paths. Loosely the meaning can be ways or roads,but specifically it will be path – a line along which a person or thing moves,a course of action. Char Rahen will not mean ‘a crossing’,but ‘Chauraha’ will mean a spot where 4 roads cross. Char Rahen will only mean 4 paths,Roads,Streets etc. In the context of the film’s story,I feel the meaning will be 4 paths,on which the 4 pairs will travel,in different directions. I meant crossroads when I wrote ‘crossing’. My English is suffering these days. Hi…are you the author of the short story Attar of Roses? is this film available online? memsaab can you just mail me the end part of the story and how all the three stories are connected to eachother? I have loved the plotline and i admire the fact that in 1959, they have made such a great story , but unfortunately its not well publicised due to which present generation is not aware of such a film. 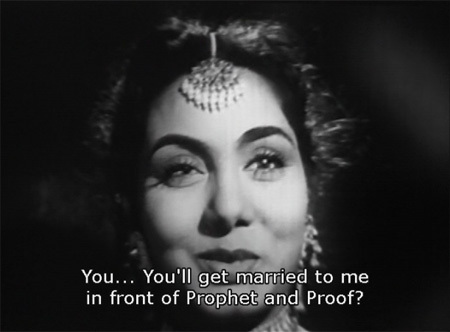 The original precursor to Salaam E Ishq surely. My only complaint with this movie is that Shammi and Raj don’t share a single frame despite coming close in this movie. I have a VCD copy and I hope a common frame was not edited? Is there such a frame in the DVD? I looked so much forward to see them share screen space in the same frame. 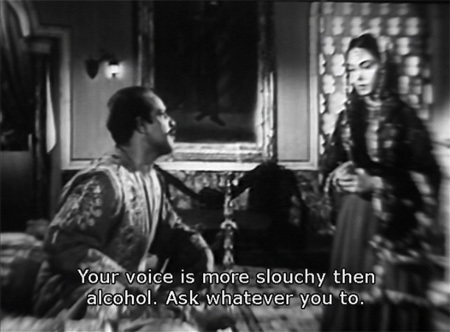 Shammi’s character was subtle with depth. Ajit’s was funny but one dimensional. Raj was his usual effable self. The thing I found funny was that in the sole fight scene in the movie it is Raj Kapoor who never looked fit or fluent in action scenes. Shammi at that point was established as an agile fighter who was fluent in action. I thought it was a travesty that he was not shown throwing punches instead. I hope you have seen my Shammi kapoor tribute video on youtube. I also hope you have seen ‘Jab Se Tumhe Dekha Hai’ Gretaji, starring Pradeep Kumar and Geeta Bali. 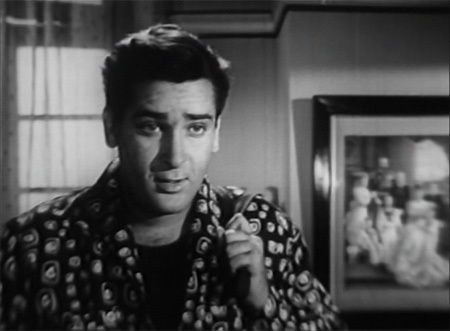 The film has a special qawaali number shot with both young and dashing Shammi kapoor and Shashi Kapoor in a guest appearance. Mindblowing song that is. I think the 4th track, the 4th love story, the 4th road was that of the patriotic trade union leader with our country and her future path. The film is excessively symbolic and yes, I thought the whole film came together brilliantly and engagingly throughout but failed in the climax. It was too sudden and too rushed after a great buildup. But I wish we had more such films to fall back on. Shaliniji, hum Shammi fans excessively like what he does. Please forgive us. @Shaliniji – is it possibile for you to share the copy of Daku movie you have with us? Can you upload it somewhere? I would be greatful if either you or memsaabji could do it for some more fans like me. The Friends VCD company that has it’s rights have only the rights but no master to batch create and sell the movie. Its frustrating and disappointing. I could do anything to have a copy of Persian fantasy Gul Sanobar, Shammi-Geeta starrers Coffee House, Miss Coca Cola and Rangeen Raatein as well.Guys like me fall in the deprived generation category, born too late in the day to to miss the classics and despite so much technology no hope to see them in any format. The video tapes were the last resource where these movies existed. this film was produced and directed by Mr.Khawaja Ahmed Abbas, a brilliant story writer, producer, director, columnist, who wrote weekly columns like Azaad Qalam and Blitz, I take pride in announcing that I am the grandson of Mr.Abbas and have lived with him during my teens. His movies namely, Aasman Mahal ,Saat Hindustani (where he introduced Mr.Bachchan), Bambai Raat ki Bahon mein, Naxalites, all carried powerful messages, but flopped at the BO because they never clicked with the masses. Yet he is to date a highly respectable individual who is looked upon by followers of literature and arts.